Come rain or shine, the Weather Station for Business Gift is always giving an update on your customer's desk with the latest humidity and temperature levels to ensure preparation for those windy, cold, or hot sunny days. Push the 'light' button on the top and a colourful display can be seen. Personalised with a corporation logo or brand name, people can remember and retain your company. 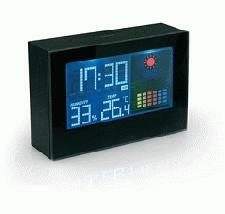 Why not hand one of these Weather Station's for a Business Gift and have it sat on their desk's? Make sure you check out our Promotional gifts for a full range of products to customise with your brand name and logo.